Shipping Australia-wide only. NZ Customers please call us to place an order. How does the THEYA bamboo fabric benefit you, the wearer? The unique bamboo mix fabric (patent pending) we use in our post surgery bras and briefs is extremely soft and completely breathable. 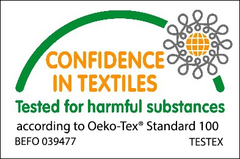 Since we only use bamboo that is OEKO-TEX Standard 100 approved, you can be sure that it is free of any harmful substances and will be kind to your skin. How our fabric supports recovery for breast surgery patients is of the utmost importance to us. We are conducting a clinical study to evaluate how wearing our bras can impact the recovery of women post breast cancer surgery. As part of the study, we had our unique bamboo mix fabric tested by independent experts in comparison to 100% cotton and fabric from a leading competitors bra. The fabric is bacteriostatic, meaning when worn next to the skin it prevents the growth of the bacteria most commonly found in surgical site infections. It is 97% resistant to the growth of gram negative bacteria (Pseudomonas fluorescens) and 93% resistant to the growth of gram positive bacteria (Staphylococcus epidermidis). By comparison 100% cotton offers 0% resistance. Since leading independent testing organisation BTTG™ developed the original “breathable” fabric, we thought they were best placed to measure just how our breathable our fabric is. They conducted thermal and water vapour resistance testing our bamboo mix. How does the THEYA bamboo fabric benefit the environment? Bamboo does not require any pesticides, herbicides or fertilizers in its cultivation. According to WWF 2.4% of the world’s crop land is planted with cotton and yet it accounts for 24% and 11% of the global sales of insecticide and pesticides respectively. Bamboo plants absorb about 5 times the amount of carbon dioxide and produces about 35% more oxygen than an equivalent stand of trees. The WWF states that bamboo plantations have the potential to be a promising part of the solution to the increasing pressure on forestry resources worldwide. © Exquisite Bodies All Rights Reserved. This website is intended to provide you with general information only. This information is not a substitute for advice from your medical professional.